I've found a good way to support my excessive reading habits. If you're like me and your drug dealer wears a Barnes and Noble apron, I want to share these resources with you. The only catch is that you have to be a blogger and your blog has to be approved by each of these programs. Here's how it works. You sign up for one, some, or all of these programs. They approve you and then they send you books to review on your blog. Some of the books will even be sent to you before their release date, so you can brag to your friends that you got the good stuff first. First, there's Viral Bloggers. This program is part of The Ooze, an online, emergent church forum/community. The program is independent of any specific publisher, and they post new books on the first of each month. Copies usually go fast, so don't waste any time. I'm working on a copy of The Naked Gospel right now. Then, there's Blogging for Books, a part of Waterbrook Multnomah publishers (a division of Random House). Blogging for Books sends out emails when new books come available. They select which ones they will offer you and you choose whether or not you want it. This program is still relatively new, so they're working out some of the bugs, but I managed to get an early release copy of Primal: A Quest for the Lost Soul of Christianity . Last, but certainly not least, is the most recent resource I've found. 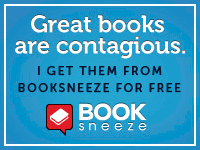 Sign up for BookSneeze and Thomas Nelson publishers will let you select, one at a time, from some of their most recent releases. I haven't gotten anything from them yet, but I anticipate getting The Hole in Our Gospel sometime next week. Apparently, they'll even give you the opportunity to preview some of the Bibles they print. Have fun and let me know how they turn out for you. If you find any more resources like these, please share! This verse is one of those gems that you read, almost forget, and rediscover some time later. Every time I read it, I am reminded that God's best work still lies ahead. Mark Beeson quoted this verse earlier this month on his blog and I had that experience of finding something I didn't know was missing, like pulling out your winter coat for the first time in November and finding $20 in the pocket. The church I serve has a rich heritage. Mt. Bethel was founded in the 1820's and officially established in 1833. 177 years later, the people of Mt. Bethel have claimed a number of traditions. Next month, we'll celebrate Homecoming, on the third Sunday of May, and we'll invite a past Mt. Bethel pastor to preach before we enjoy a lunch of countless and sometimes mysterious casseroles. If you ask anyone who has been a part of Mt. Bethel for very long about their tradition, they can tell you. Diane, our Church Historian, knows the church and the area around it better than anyone else I've met. When she looks around, she sees more than we do - she sees the general store on the corner that was torn down decades ago, the old plantation just up the road that is now a large subdivision, and the important people that I only know as headstones in the church's cemetery. You can learn much about the psychology of a congregation when you know its traditions. Tradition is vital to our understanding of God. Every good Methodist knows that the Wesleyan Quadrilateral outlines the sources by which we derive our theology. Scripture is our primary source of knowing God, but it's informed by our reason, our experience, and our tradition. Tradition shows us how God has been present to those in need, how he has picked us up off the ground and dusted us off and how often he has offered us grace and mercy when we've done some ridiculous things. What tradition do you come from? How does it shade your understanding of God? I asked a candidate for ministry that question yesterday. Some ministers and some churches see the shadows of their heritage and rather than living with and learning from those scars, they simply discard any tradition and try to be something completely "new." Other ministers and churches embrace their tradition as the "good ole days" and try to convince the rest of us that there's nothing better than life in the 1950's (before cell phones, email, bad traffic, and integration). My next question to the candidate was, "How do you intend to move that tradition forward?" The tradition that informs my understanding of God and the world is a conservative one. I come from the first church on the city square with people and means. Preaching was usually strong and always grace-filled. These churches were usually in the middle of poverty-stricken communities and not the best at reaching out or drawing new people in. But, once new people came in, they were the best at taking care of them. I am the result of a community that nurtured and cared, that held me accountable and afforded me every opportunity to know God and serve him. My tradition could be a little pretentious at times. Easter was a hat-wearing competition for some of our ladies. The youth group was cliquish at times. The preacher was always someone with chevrons on the sleeves of his robe. Brass memorial plaques were found in hallways, classrooms, offices, and of course, all over the sanctuary. My tradition, though it was a good one that benefited me and serves me well now, is far from perfect. If my life is going to make a difference and my ministry is going to be fruitful, I have to ask that second question - how will I move my tradition forward? I can do like many others - I can enforce tradition as law. I can do the expected. I can learn from the mistakes of those who came before me, but be unwilling to make some mistakes of my own. I can do that, serve for 40 years and retire with a pat on the back from my Bishop and colleagues, but is that really good enough? Is it enough to push the pause button on history and live with the security of knowing what comes next? As the Church, we have not arrived at perfection, despite the self-praising of some Christians. The truth is that our work is never done until every person knows Christ and has a relationship with Christ. And guess what - people who don't know Christ are being born every day. I figured up the other day that if the mandatory retirement age for United Methodist pastors stays at 70, I have 40 more years of ministry before I have to retire. I've served for five years already. I hope that in 2050, I'll be able to look back and know that my life's work has made a difference. I pray that those who come after me will have a better tradition and heritage to claim because I was a part of it. Don't ask, "Why were the good ole days better than these?" That's a foolish question - today is another day on the way to God's Kingdom fully revealed on earth. God's greatest plans for us still lie ahead if we will get off our tradition and drag it forward through the ages. What do children add to your church's life? What have they taught you? What are you teaching them? Many parents today expect the church to teach them everything about God. Parents gladly take a back-seat in hopes that their child has the right spiritual mentor. The truth is that faith in God usually sticks better when a child can look at the difference it makes for their mom or dad. Monday through Saturday, the way a parent lives their faith will make a more lasting impact, hands down. Some parents become apprehensive when it comes to teaching their kids about spiritual matters. We know how to teach our kids to recite the sing-song blessing before dinner, but what about teaching them to really pray? I have a resource for you. In February, Waterbrook-Multnomah released This Little Prayer of Mine by Anthony DeStefano. It's a short, simple children's book, endorsed by the National Day of Prayer. My kids love to read and be read to and this is a good discussion starter with any child. Beyond "God is good" prayers, this book is one prayer, being prayed by a child, that covers several aspects or types of prayer from petition and intercession to repentance and thanksgiving. In fact, this book is so well-rounded that parents may find themselves learning from it. This book is a good one for every home with kids. I've got an extra copy for a giveaway. I'll give it to the first person with kids to leave a comment. Leave your name, email address, and how many kids you have and I'll send this copy to you. *This book was provided for review by the WaterBrook Multnomah Publishing Group. Get your copy at the link on the right or HERE.